In late 2008, a fast-food burger restaurant in Sweden received an odd complaint letter. It was from a mother of two, asking the chain to get rid of the boxes that its kids’ meals were packaged in. Her children only wanted the fries and toys, she said, and she was annoyed at having to throw the boxes straight into the recycling bin. It was an unusual request with an unusual outcome. Max Burgers — Sweden’s No. 1 burger chain — decided to do away with the kids’-meal boxes in all of its 75 restaurants, explaining to customers that it was reducing waste. No one complained. In fact, sales of kids’ meals rose. The company had turned sustainability into a selling point. Max didn’t just get rid of its kids’-meal boxes, though. Since 2006, the chain has reassessed its entire enterprise, searching for ways to reduce its environmental footprint. It has installed energy-efficient grass roofs on 12 new restaurants and cut energy consumption by 20% company-wide. The chain buys only wind power and offsets all its carbon emissions by planting trees in Uganda. And in 2008, Max started putting CO2 labels on its menus, quantifying exactly how much carbon dioxide, from field to fryer, is emitted in making each dish. “One of the problems being a burger business is, of course, the beef,” says Max’s chief sustainability officer, Par Larshans, noting that the meat industry is responsible for about 18% of global greenhouse-gas emissions. By showing that its Grand de Luxe Cheese ‘n’ Bacon beef burger produced five times more carbon dioxide than its vegetarian burger and six times more than its fish sandwich, Max hoped to nudge customers toward a more sustainable choice. It worked. Customers started eating more nonbeef burgers, causing sales of the low-carbon alternatives to jump by 16%. Meanwhile, Max began eating up the competition. From 2005 to ’11, the chain opened 45 new restaurants and more than doubled its market share in Sweden. In 2008 — the year it put its carbon labels on menus — Max became Sweden’s most popular burger chain, according to a survey of 250 brands carried out by the market-research firm ISI Wissing, trouncing McDonald’s despite the fact the American chain has three times as many restaurants in the country. With a 16% operating profit, Max has also become the most profitable burger franchise in Sweden. And after opening its first franchise in Norway last year, it’s eyeing expansion across Europe. So how did the company do it? For one thing, the green initiatives seemed to boost customer loyalty, which increased by 27% from 2007 to ’09, according to a survey by the global media network Mindshare. But the real key was drawing in new customers. Vegetarians who might never have set foot in a fast-food restaurant now drop into Max for its veggie Greenburgare, bean salad and a Lyxshake Jordgubb (strawberry milk shake). Max Burgers isn’t alone — fast-food chains elsewhere have also started burnishing their green credentials in recent years, with positive sales results. In the U.S., the Mexican-food chain Chipotle — which sources many of its ingredients locally and buys nearly half its beans from organic farms — has tripled its revenues since 2006 to $2 billion and now has more than 1,200 stores. Naked Pizza, which launched in 2009 in New Orleans and serves pies topped with hormone- and antibiotic-free meats, has plans to expand to 500 stores worldwide from its current 24. 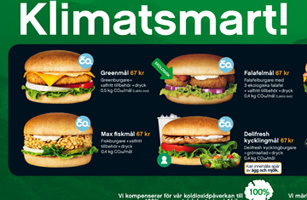 And in 2010, a vegetarian chain called Otarian launched in New York City and London with menus showing the amount of carbon dioxide emitted while making each food item (1.37 kg for a mushroom-quinoa burger) as well as the amount emitted by the typical fast-food equivalent (2.96 kg for a beef burger). Customers can store up the difference on a “Carbon Karma” card and redeem it for a free menu item of their choice. Major companies have also experimented with measuring carbon emissions. Walkers (Britain’s biggest potato-chip manufacturer) and Coca-Cola have both begun monitoring the carbon footprint of their U.K. products with the help of the Carbon Trust, a British nonprofit group. For the companies, it not only improves their corporate image but can also save money. Walkers, for example, noticed it could cut costs by asking its farmers to water their potatoes less. “When you’re making [potato chips], you’re trying to get rid of most of the water,” explains John Kazer, a carbon-footprint-certification manager at the Carbon Trust. Drier potatoes take less energy to transport and bake to a crisp. While carbon labeling and other environmental initiatives have caught on in some corners of the fast-food industry, however, they’re still not a huge selling point in the U.S. “Ultimately, with Chipotle, it’s a 1¼-lb. burrito,” says Darren Tristano, executive vice president of Technomic, a consultancy that monitors food-industry trends. “I think they’re going to win on portion and value more so than the environmental integrity.” In fact, the numbers show that diners interested in sustainable food are in the minority — only 27% of U.S. consumers feel it’s important that their restaurants be environmentally conscious, according to a 2010 Technomic survey. This entry was posted on Monday, April 23rd, 2012 at 8:00 am and is filed under Eco Friendly, Food, Health & Wellness, Ingredient, Menu, Menu Development/Innovation, UK. You can follow any responses to this entry through the RSS 2.0 feed. You can leave a response, or trackback from your own site.